Trichologists – are often referred to as hair doctors. However, most Trichologists are not medical doctors, but specialists in the field of hair loss and scalp disease. Our team are registered consultant Trichologists with the Trichological Society. A Trichologist is considered an expert in the field of hair loss and scalp disease. Please be mindful that there are many that call themselves hair doctors who have little or no qualifications. Some have taken a one day course in laser therapy. The best advice is to ask who the practitioner has qualified with. 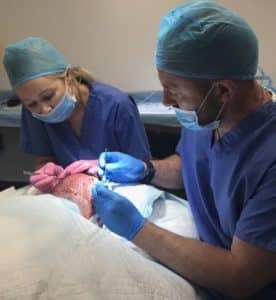 Hair restoration surgery – We have a number of registered surgeons who work with our team of Trichologists conducting hair restoration surgery. These surgeons are highly trained hair doctor, in the field of hair restoration surgery. If you are thinking of having hair restoration surgery, why not take advantage of a free consultation. We will be able to give you step by step information on the procedure and most importantly whether you are suitable. All of our practitioners are qualified and registered with the Trichological Society (TTS). The TTS is a world wide governing body which regulates the practice of trichology and hair doctors. The qualification and ethics are governed by the Trichological Society the Worlds leading authority in the fields of Orthodox Hair-sciences & Hair-specialisms – Worldwide. Please feel free to review the Trichological society’s website or contact them who would be happy to confirm our credentials. Our team of trichologists has a combined level of experience of over 80 years. Consisting of Professor Barry Stevens FTTS, Mr Edward Stevens BSc FTTS FBIH and Miss Claire Stevens FTTS. Finally, if you are suffering from any form of hair loss or scalp condition, please seek advise. Who ever you choose to visit do so as soon as you can. Many hair loss and scalp conditions can be dealt with quicker is dealt with immediately.